OPINION: How supporting a local film and TV industry could help Arctic economies diversify. Armed horsemen, resembling grayish, black shadows emerge from a porcelain-white haze. The horsemen descend on a Norwegian village, engulfing it in flames, amidst a visually stunning, snow-draped landscape. 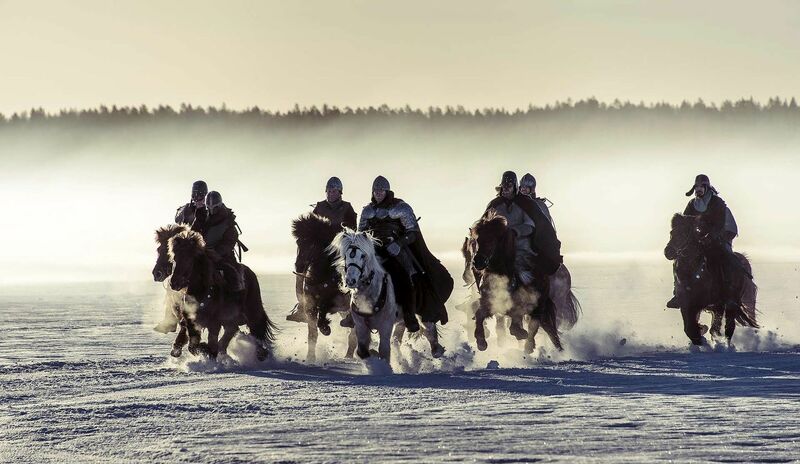 These images bring to life the historical drama, “The Last King” (titled “Birkebeinerne” in Norwegian.) The 2016 film, currently available on Netflix in the U.S., is one of a growing list of noteworthy film and television series filmed in Arctic countries that caught my attention. I had never thought of Nordic countries as producers of film. And yet, here I was, utterly transfixed by a Norwegian film with English subtitles. The psychological thriller “The Girl with the Dragon Tattoo” and the American television series “Game of Thrones” are fellow members of this list of cinematic hits with scenes filmed in Arctic countries. Among Arctic countries, Iceland, in particular, has emerged as a darling of the American film industry. It has been selected for picturesque scenes in two James Bond movies, as well as “Batman Begins” and “The Tree of Life.” And the attraction to Iceland has not stopped at filmmakers. The Icelandic tourism industry has experienced staggering growth in recent years. Notably, one survey — cited by the Nordic Council of Ministers — indicated that 20.1 percent of tourists in Iceland referenced film as a primary reason behind their visit. While Iceland has already seen tremendous benefits linked, at least partially, to film and tourism, other Arctic countries have not yet experienced such success. The Arctic region is largely economically dependent on resource extraction industries that are unsustainable and detrimental to the environment. According to CNBC, four of the eight Arctic countries are among the top 15 largest oil producers in the world. The region needs to move towards economic diversification and a knowledge-based economy to pursue a more sustainable future. Following in the footsteps of Iceland, a shift towards creative and cultural industries, such as film and television, is one of several moves that Arctic countries can make to prompt an economic transition and re-orient thinking on what future-state Arctic economies can look like. Film and television industries create diverse employment opportunities, generate local economic activity and provide a creative outlet to preserve and promote local cultures. They also draw from a plurality of other creative industries (e.g. writing, editing, advertising, cinematography etc. ), producing opportunities for a variety of professional fields. Recently, a range of public support schemes for the film and television industries in Nordic countries has enabled visible growth. Nonetheless, more can be done to reinforce support for film and television industries in order to actualize their full economic potential. For every dollar spent on film production, an average of $2.34 is generated in economic activity, according to a recent study on how governments can support film industry development. Included in that multiplier effect are local film crews using hotels and restaurants, patronizing the local hospitality industry and importing equipment and tools and using local transport services. In addition to this benefit, film production also creates full-time and freelance employment opportunities that are open to all. Creative industries typically have better gender representation than conventional industries, according to research conducted for UNESCO. So how can Arctic countries reap all these benefits? In order to reimagine and enhance existing infrastructure, tangible investments must be made in the immediate future. First, it is imperative to advertise Arctic film to international investors and film entrepreneurs to raise the profile of the Arctic region in film and television. Existing channels, such as the West Nordic International Film Festival and the Skábmagovat Indigenous Peoples’ Film Festival, in Finnish Sapmi, can be leveraged and then expanded upon. There should also be public and private cooperation to support all parts of the film industry value chain — acquisition/development, production, distribution and exhibition. Currently, several Arctic countries provide either public funding or a 25 percent rebate on production costs of locally filmed movies. While this may not be financially feasible for the other Arctic countries, incentives could be designed in other ways to prompt more film production activity. Last, but not least, there must be a conscientious effort to build local capacity amongst film professionals in Arctic countries. This may take many forms. It could include promotion of knowledge-sharing efforts amongst film professionals. It could also involve initiatives with universities, production studios, film institutes and film festivals. Regardless of how it’s done, skill-building to cultivate a local workforce is crucial; otherwise film production could rely on external talent, instead of Arctic residents. The transition to a more sustainable, knowledge-based economy in the Arctic won’t happen overnight, but there are already instances of innovation in the film and television industry occurring. There are things that can be done, in the present, to support Arctic film and television and transition Arctic economies from unsustainable, finite resources to the unlimited resource of human creativity and artistic expression. Reine Rambert is a first year Master of Public Policy Student at Harvard Kennedy School.